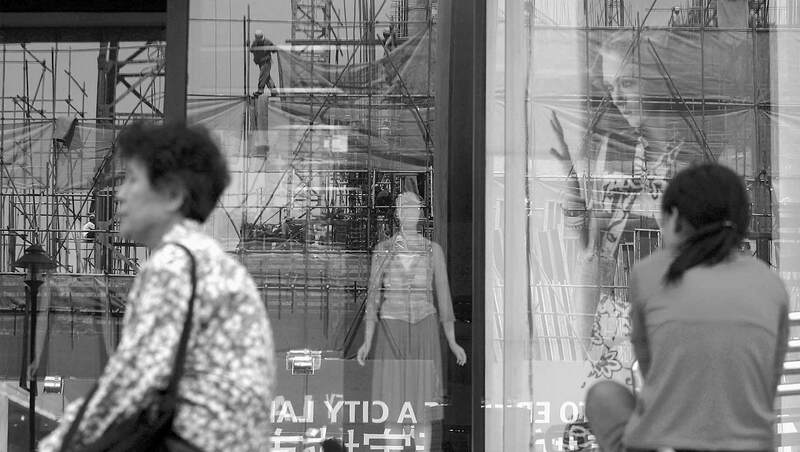 46% say China's economic power is a "critical threat"
WASHINGTON, D.C. -- After a year of escalating trade disagreements between the U.S. and China, Americans' views of the country have dropped sharply to their lowest levels since 2012. Currently, 41% of Americans say they have a favorable view of China -- down 12 percentage points from last year. These data are from Gallup's annual World Affairs poll, conducted Feb. 1-10. President Donald Trump has long criticized China's trade policies, accusing the country of manipulating its currency and taking advantage of the U.S. But his steady anti-China rhetoric didn't affect Americans' views of the country in 2017 and 2018, as Americans' favorable views of China edged up. Global approval of China's leadership also improved during this same period. In 2019, however, views have reverted to about they were in President Barack Obama's second term. This decrease in favorability comes as Americans have become more likely to say that China's economic power poses a "critical threat" to vital U.S. interests over the next 10 years. 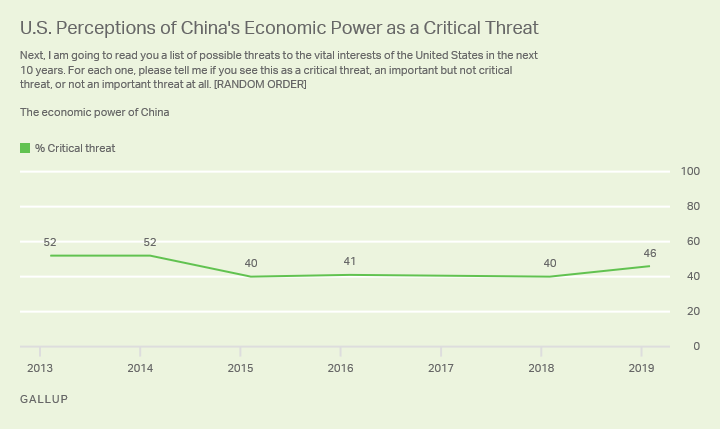 The current 46% who say China's economic power is a critical threat is up from the 40% to 41% recorded from 2015 to 2018 -- though not as high as the 52% recorded in 2013 and 2014. Meanwhile, Americans' views of Saudi Arabia took a similar hit in 2019: Its overall favorable rating is also down 12 points from 2018, when views of the country had improved after Trump visited during his first trip abroad as president in the spring of 2017. The current 29% who view Saudi Arabia favorably is near the record low of 27% recorded in 2002, just months after the 9/11 attacks, which were perpetrated largely by Saudi nationals. Americans' neighbor to the north remains the most favorably viewed foreign country: 92% of Americans have a "very" or "mostly favorable" view of Canada. Meanwhile, more than four in five U.S. adults have a favorable view of Great Britain, Japan, Germany and France. At the bottom of the list, fewer than one in five have favorable views of North Korea, Syria, Iran, Iraq and Afghanistan. Next, I'd like your overall opinion of some foreign countries. What is your overall opinion of [RANDOM ORDER]? Is it very favorable, mostly favorable, mostly unfavorable or very unfavorable? North Korea is the only country that is viewed more favorably in 2019 than it was in 2018, with its favorable rating increasing from 6% to 12%. Despite this, North Korea remains Americans' least-favorably viewed nation. No year-over-year comparisons are available for Turkey and Venezuela, which were not measured in 2018. But each country is at a new low in its respective trend. Turkey, with its current 42% favorability, is down from the 48% to 63% ratings it received in polls from 2003 to 2007. Venezuela's 34%, meanwhile, is slightly below the 37% to 41% ratings it received between 2007 and 2013. Americans have mostly positive views of India, South Korea, Israel, Mexico and Egypt. Just over four in 10 have positive views of Cuba, Turkey and China. And about a third or less have favorable views of Venezuela, Saudi Arabia, Russia and the Palestinian Authority. Views of Cuba had improved markedly, peaking at 54% in 2016, as the Barack Obama administration worked to normalize relations with and loosen travel restrictions to the island. But Trump has rolled back much of these efforts, and Americans' favorable ratings of Cuba have in turn decreased slightly each year since Trump took office; they are now at 44%. To the extent that Americans' opinions of foreign countries have changed in the past year, it was primarily in a negative direction. North Korea is the only country whose ratings increased by a meaningful amount, while others, like Saudi Arabia and China, showed meaningful declines. Turkey, Venezuela and Russia have all hit low points in Gallup's trend. But Americans remain very positive in how they view their Canadian neighbors, as well as their allies in Europe and Japan. Countries that experienced declines in favorability did so because of friction with the U.S. How their relationships play out in the coming year will determine whether these ratings improve or continue to slide. Americans' ratings of other countries have historically been sensitive to the news about U.S. relations with these countries -- with China and Russia providing clear examples of how Americans' ratings have been good or bad over time in response to events.